What was the inspiration behind you staring up an independent whisky bottling company– did you have a particular light bulb moment? The light bulb moment came when I was stravaiging through my early 40s, completely unsure what I was going to do. And then I came upon an opportunity to purchase some stunning whisky that was well above my means. It was one of those moments I knew If I didn’t take the plunge and purchase that first parcel of whisky, I would have always wondered, “what if?”. Is your vision reflected in the company name? Yes, absolutely. It was my wife Zoë who said those two words, ‘North’ and ‘Star’, it just seemed right. I thought, what better name than something that’s True North, a navigational tool, an accurate timepiece millions of miles away, but so special. Tell us more about the independent market and how it differs from the mainstream. Independent whisky bottling is a beyond exciting industry that mostly flies beneath the radar of mainstream consumers. When we buy and bottle one cask of whisky, I am governed by how much whisky is in that one cask. For example, I may purchase a delightful cask of 10-year-old Laphroaig, and when I empty that cask to bottle, there will be roughly 250 bottles available. I bottle at cask strength and I am very transparent on the label as to what wood it is matured in, the ABV, when it was distilled/bottled and the unique tasting notes of that single cask. Every cask is different, which means that when those 250 bottles are sold and consumed, there will never be another exactly the same; it’s a joy. Mainstream brands are mostly about consistency. Nose, taste, ABV and sometimes colour have to be the same. This highly skilful process of blending casks from a single distillery is what it takes to keep a brand in the mainstream. North Star focuses its energies on the curiosities, peculiar oddities and obscurities - whisky as it comes, straight from the cask and into a bottle - nae funny business. To purchase alcohol under bond, you need what is called a WOWGR (Warehouse keepers and Owners of Warehoused Goods Regulations). I speak with producers, brokers and other good bottlers for supply. I try to bottle between 6-9 North Star casks every quarter. Once I have chosen what casks to bottle, I will draw samples and send one of each to my 12 export markets. The importer of each country then tastes and decides how many cases to order from each cask. Then I set about allocating - ideally you have a couple more orders than you do whisky. I imagine a lot of the success will be determined by your knowledge and networks – how important has that been to your formation and growth? Any other important ingredient to starting out? Relations are a key ingredient to any businesses success, but before you have good relations you must surround yourself with good honest people. I firmly believe that with these two ingredients, mixed with hard work, anything is possible.... There is of course also luck that you must create yourself. How do you source whiskies to bottle and how much of a challenge is it to get your hands on premium stock? Well supply is a closely guarded secret - most bottlers will tell you that - but it is a challenge, I’ll grant you that. The challenge is fun, exciting - a few let-downs mixed with triumphant purchases that are worthy of late-night celebrations. Being offered a cask of whisky that you know is different from anything you’ve ever tasted, and being able to put my label on it must be up there with some of the best jobs in the world. What makes an attractive whisky to you? …. whiskies that act as a time machine. Nosing a whisky that takes you back to a time you may have long forgotten. Recently, I bottled a cask of whisky from Campbeltown. When I opened the cask for the first time, it was that wonderful ‘cold rain on hot tarmac’ smell; this then reminded me of walking down Ferry Brae in Dunoon with my Gran when I was 8…. That’s what I call an attractive whisky. Tell us about one or two in your portfolio you are particularly proud of – and why. I currently have three parts to the business: The Single Casks, The Blended Malts and The Blended Scotch. I can’t take any credit for the making of any of the liquid, which makes it easier for me to say it’s all bloody good. However, there was a particularly memorable single cask of 30-Year-Old Bunnahabhain I bottled that reeked of tropical notes you just don’t find in whiskies any more - this was made in a time when no one was in a rush, with 100% traditional methods. The Blended Malt range we bottle is named after the star VEGA. Blended malt is a blend of single malts from a number of distilleries. We have bottled a 23-year-old, 40-year-old and 41-year-old - and I’m delighted that these have all been very well received, although I keep it to only 400 bottles, so it’s pretty hard to get hold of. The Blended Scotch range goes by the star name SPICA. Blended scotch is a humble liquid using other grains along with some barley, depending on the blend. This too has been well received, and with each bottling yielding 1000 bottles, slightly easier to get your hands on. Are you targeting high end consumers, is the portfolio fairy accessible or a mixture of both? With every range of casks I bottle, I make sure that there is a whisky for everyone. Not only must each offering have a different taste profile, but we make sure we cover most people’s budget. When I was in my early 20s and first beginning to appreciate a good whisky, the opportunity for me to taste whiskies I have access to now was impossible, as the opportunity wasn’t there, and it was also cost prohibitive. When buying a bottle of whisky for myself, or for Dad on Father’s Day, I had a staple budget of £40 and sometimes maybe up to £50. In my series of each casks, I want to look after the person with that budget. You’ll find North Star single cask bottlings retailing anywhere from £35 - £200. The packaging and labelling of your bottles look absolutely immense! Is that reflective of targeting a specific market? Younger folk perhaps or are you looking at a broader church? Well thank you. My wife Zoë said to me, “…if you’re going to do this, make it look good”. I took her advice and worked with a great company called Pocket Rocket to create the branding; not only seriously good guys, they’re bursting with creative energy. The label takes some influence from the inner workings of an orrery which if you haven’t seen, ‘tis beautiful. North Star needs to appeal to everyone (over 18 of course) without any faff - I didn’t want cartons to put the bottle in: I don’t think our poor planet needs more rubbish, and my customers don’t want to pay for pointless boxes - they want the liquid in a bottle with a label… job done. I chose a wide bottle, which allows me a lot of real estate on the retail shelf. 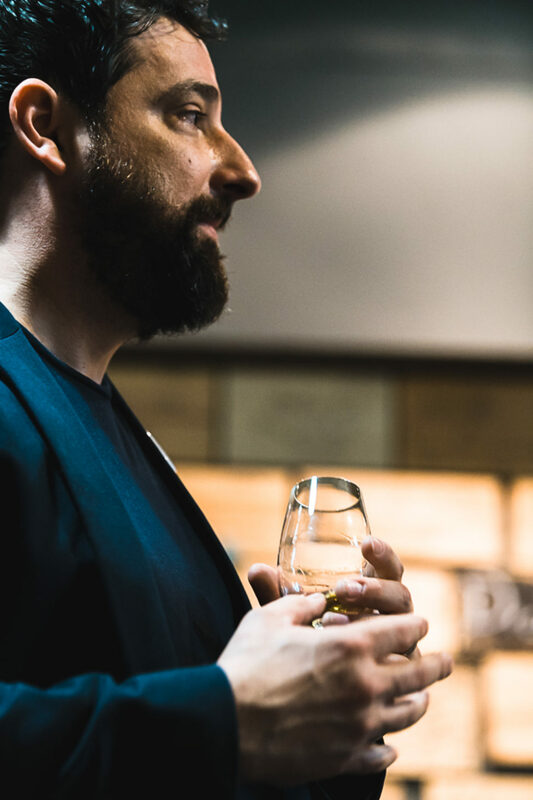 If I can get the consumer to see my bottle and walk over to read an interesting label with all the information they need, well that’s a good thing – after that, the whisky has to do the talking. Funny moments, high points in journey so far? I work at least 9-5 every day from a shed at the bottom of our garden. I operate all the administration and sales side of the business there - I find it more than comfortable for me and the Jack Russell. When my export markets visit Scotland, they always like to come up to North Star Spirits Ltd, then squeeze into the shed, look through some dodgy 90’s vinyl and dram away until their heart’s content with some of my Mum’s famous tablet. When I had my first visit from HMRC about my WOWGR licence, it was a good ice-breaker pulling up the deck chairs and using plant pots as a coffee table. Anything you’ve learned now you’d would apply if you went back to 2016? No dramming on a school night, one of the many hazards. A couple of days work have been missed by let’s just say taking my work home with me.